The Table Tennis from Rio 2016 is opened by the Women’s Singles preliminary round (9:00 – 10:30) where six matches will take place. Australia’s Melissa Tapper, who made history by becoming the first Paralympian from her country to qualify for an Olympic Games, takes on Brazil’s Caroline Kumahara in the preliminaries with Dina Meshref (Egypt) and Heba Allejji of Syria also involved. Rising star from the USA Kanak Jha, will then feature in the Men’s Singles preliminary round (9:45 – 11:15) as he faces Iran’s Nima Alamian. Vanuatu’s Olympic flag bearer Yoshua Shing goes head-to-head with Mexican player Marcos Madrid, while Puerto Rico’s Brian Afanador plays Suraju Saka for a spot in round one. We then head into the main draw, with round one of the Women’s Singles event (11:15 – 12:45) bringing the first session of the day’s Table Tennis to a close. While results from the previous round impact who participates in round one, there are some matches for which we already know the line-up. Columbia’s Lady Ruano is drawn to play Iveta Vacenovska (Czech Republic), Daniela Monteiro Dodean (Romania) faces Mouma Das (India), while Canadian player Mo Zhang plays Hana Matelova of the Czech Republic. Following the first break of the day, the Women’s Singles resumes until the conclusion of round one (14:30 – 16:00). 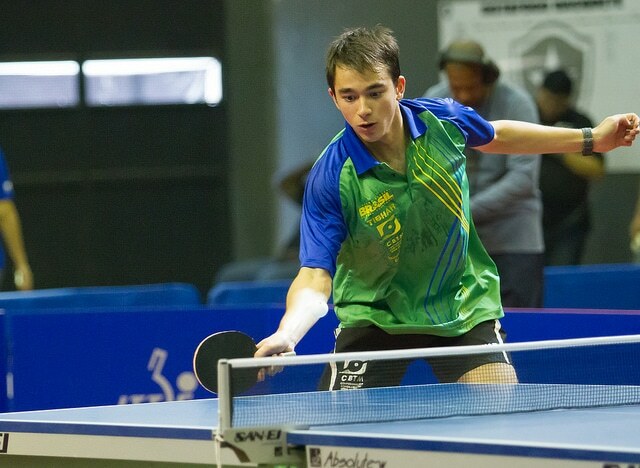 Round one of the Men’s Singles event then follows (16:00 – 17:30) as home favourite Hugo Calderano (Brazil) will look to negotiate his way through to the next round in his tie with another South American, Andy Pereira (Cuba). Soumyajit Ghosh (India) is also in action in round one against Padasak Tanviriyavechakul of Thailand. Day one will conclude with the end of the Men’s Singles round one, and the start of round two for the Women’s Singles. Seeds 17-32 will take part in round two of the Women’s Singles, meaning appearances from Elizabeta Samara (Romania) Li Qian (Poland) and Kim Song I (Korea DPR) are to be expected. Watch the Olympic Table Tennis live HERE. Official Rio 2016 Table Tennis page.